On our recent trip to Pho Dang in Winooski, we immediately noticed that not only did North Main Street have a phở joint, it also seemed to have it’s own little Southeast Asian neighbor, with several Asian-related businesses nearby. One of them, Dharshan Namaste Asian Deli, is directly across the street from Pho Dang, and proudly sports “Bánh Mì” sandwiches in their window. I love a good bánh mì, so, a few weeks later when we were back in the Winooski area, we decided that we’d duck in and try Dharshan Namaste and see how they did. “Deli” isn’t necessarily the greatest name for the place: like Pho Dang across the street, it’s basically a house converted into a cozy restaurant, with a mix of takeout and table service. But the menu is quite interesting: it’s basically pan-Asian, with everything from mango lassi to bánh mì, to dumplings, to big piles of fried chow mein noodles, the food here is a combination of Chinese, Vietnamese, and Nepalese flavors. Looking over the menu, we went pan-Asian as well, ordering up a pair of bánh mì, a plate of dumplings, and a plate of Vietnamese egg rolls. 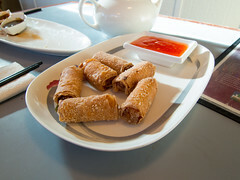 The egg rolls came first, and I was generally quite pleased with them. A nice flavorful pork and vermicelli filling with a lot of seasoning, wrapped in a light and crispy and not greasy wrapper. Again, however, I wish they’d serve these up in the traditional Vietnamese style, with lettuce and herbs to wrap around them, but the fundamental egg rolls themselves were very nicely done. Next was the dumplings. Overall, these were your basic Chinese-style pork dumplings, with a very pleasant smooth pork filling, steamed just to the point of being done. The actual star here was the pair of dipping sauces. One was a simple mix of hoisin and sriracha with some herbs added, but the other was a very pleasant red dipping sauce made from ground tomatoes, ginger, and several other spices. Combined with the nice pork filling in the dumplings, and these were a serious steal at $4. And then the bánh mì. This was a seriously good bánh mì, with most of the aspects I look for. The pork itself was nicely seasoned and had a very nice, crispy fat layer on it. The pickled carrots were piled high, as were the layers of pickled daikon. Add in a fairly zesty mayo, and a heapload of cilantro, and this a crispy, flavorful, and very well-balanced sandwich. About the only improvement I could hope for is in the bread: I usually like my bánh mì on a more traditional French bread, while this was served up on a roll that was a fair bit flakier. I actually enjoyed it, but think I’d like a classic baguette a bit better. 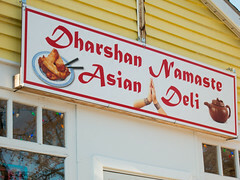 But overall, Dharshan Namaste impressed: the cozy restaurant features a friendly staff, a surprisingly large and varied menu spanning several Asian cultures, and some good food. And the prices are quite reasonable as well. I’d love to come back for a sandwich, or to try one of the giant steaming piles of chow mein that most of the other tables were dining on. They certainly looked yummy enough.